Atelier OPA » KENCHIKUKAGU won DFA silver award! You are here: Home // Kenchikukagu (English) // KENCHIKUKAGU won DFA silver award! KENCHIKUKAGU won DFA silver award! The high standards of design in Asian countries have attracted increasing international attention in recent years, with a vast number of creative designs on the world stage being the brain child of Asia designers.In 2010 December, ATELIER OPA got DFA silver award for KENCHIKUKAGU. Another award winner of this year are: Apple iPad, Samsung 3D TV LED9000, Dyson Air Multiplierand Japanese eco-fliendly products. 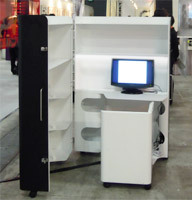 December 2nd to 5th 2010, BODW, the flagship event presented by Hong Kong Design Centre. Designer: Toshihiko Suzuki, Manufacture: Tailong Motorcar Ornament Co.,Ltd. 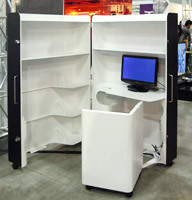 Would you want to buy FOLDAWAY OFFICE ? Kenchikukgu is an ingenious and user-friendly multinational furnishing system that makes optimum use of living space and complements any interior. It has been designed to serve the practical needs of people who live in the world’s densely populated cities, by allowing them to conjure up an extra room in their small home whenever they need it. So, if they have no kitchen, office or guest room, one can be created by simply opening a unit of Kenchikukagu, just like a suitcase. It can be folded back up again when it is no longer required. The units are mounted on casters, so they can be moved around at will and placed anywhere. When it is not in use, a Kenchikugau unit also serves to segment domestic space. The Kenchikukagu concept has attracted considerable interest since its creators posted a video about it online in late 2008. It has been reported in design magazines and on TV in Asia, Europa, the USA and Middle east, This indicates the worldwide appeal of foldaway technology that uses space more efficiently flexibly. 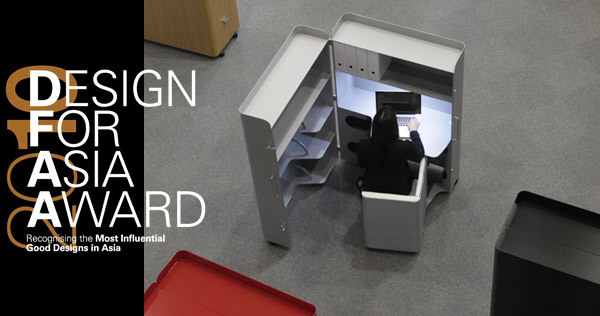 Two versions of Kenchikukagu office unit, with a wooden or aluminum finish, have already been successfully launched in Asia and Europe. Production of kitchen and guest bedroom units and a miniature foldaway office for children are now in the pipeline. An automated foldaway guest room unit is also being developed to meet the special needs of the elderly. Adhering to a philosophy of “design and hospitality beyond borders”, Atelier OPA is a Tokyo company that specializes in innovative products, art, interior design and architecture. Its driving forces are Professor Toshihiko Suzuki, and architect whose work has been exhibited globally at shows like the Milano Salone, Italy, and Designer’s Block in London; Dr Yuki Sugihara, an artist, researcher and keen amateur linguist; and designer Munetaka Ishikawa. 6 Responses to " KENCHIKUKAGU won DFA silver award! " Salve, siamo interessati ai vostri prodotti della linea KENCHIKUKAGU!!!!!!!!!!! Trovando degli ottimi mobili, siamo interessati per fare da rivenditori. Siamo italiani, showroom di Catania. Aspettiamo vostro gentile riscontro. Buon giorno! Siamo appassionati della cultura italiana. Pensiamo di partire per Milano in maggio. Ma, non posso andare a Catania. Mi piacherebbe vedere vostro showrooom. Stasera scrivo una mail. Ci sentiamo. Chao!! Me encanto su linea KENCHIKUKAGU. seria posible ver un catalogo por la red?